Leatherette-grained stock provides a richer look and feel. Die-cut business card slot on inside front pocket keeps contact information at hand. 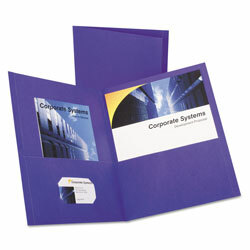 Front Cover Color(s): Purple; Back Cover Color(s): Purple; Sheet Size: 11 x 8 1/2; Capacity (text): 100 Sheets. Paper contains 10% post-consumer recycled fiber, 10% total recycled fiber. Purple Portfolio and Report Covers from Oxford! 1020 In Stock today.